Hello Divas, so on Saturday I had my eyebrows threaded and decided to share with you my diva-ish eyebrows. Threading as the name suggests is a method of hair removal using a thread, a technique which was developed and perfected by the Indians or people from the Middle East. It’s quick, less painful than waxing and your eyebrows stay neat for about 3 weeks before any re-growth. So it lasts roughly 3 to 4 weeks depending on how fast your hair grows. It is good because it saves you from having them shaved every week. For more information on eyebrow threading click here. Now unto the pictorial. 1. Comb your eyebrows in place. 2. Draw the outline of your eyebrows using the eyebrow pencil. 3 Fill in the eyebrows with the pencil using soft strokes,with as little pressure as possible. 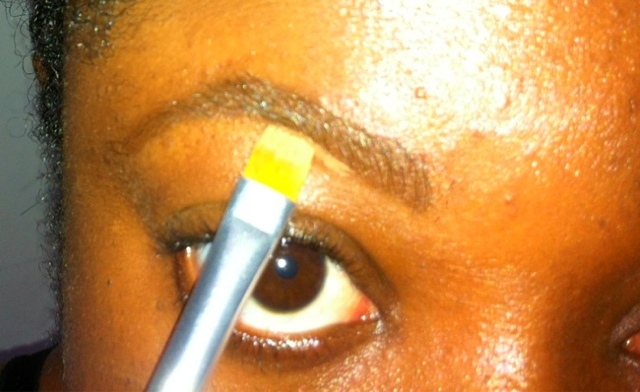 4 Brush through the eyebrows to ensure pencil shading is well blended and shape with brow comb. 5 Apply your Concealor as highlight and trace the outline of the lower brow line. 6. Trace the outline of the upper brow line. 7. Blend the concealor using your fingers or brush gently to reduce harsh lines. nice Annette, i am going to try this for sure!